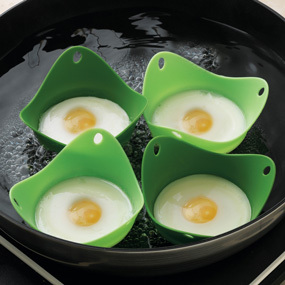 The Poachpod is a flexible silicone cooking tool for poaching eggs, baking and molding. The Poachpod allows you to float and poach an egg in boiling water like a lily pad on a pond. When the egg is ready, flip the nonstick pod inside out and gently push the perfectly domed shaped egg out. Place the pod in the dishwasher for easy clean up. Price is per pair of pods.